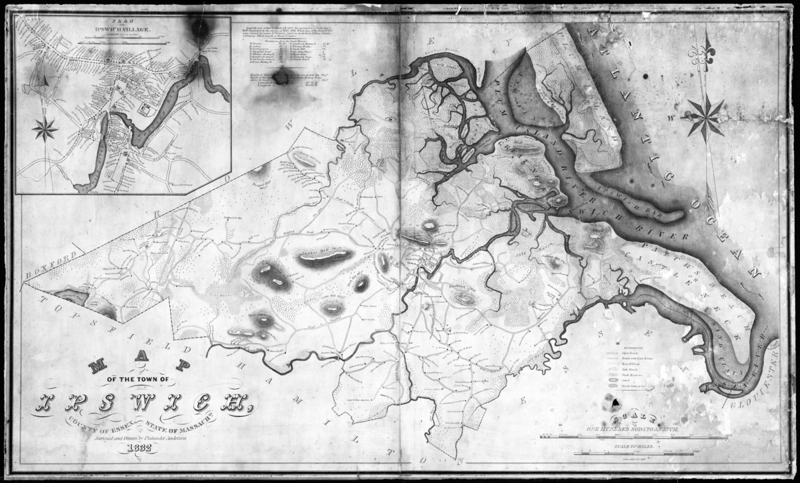 As early as 1725, a group of Ipswich residents living on the south side of the river appealed for the right to build a separate church “for their convenience,” but no action was taken at that time. In December, 1746, sixty-eight members of the Ipswich Congregational Parish signed an agreement pledging themselves to be incorporated as a separate Parish as soon as it could be approved by the General Court, and to build a meeting house near the South Green. They addressed a meeting at the First Parish on December 19 praying to be set off as a distinct body. “First. For that the Parish at this Time is so large that is sufficient to make Two either of which will be Considerably larger than most of the Parishes round about us. Secondly, For that the Parish having now but One Minister and their Meeting House altogether Unfit to meet in, it would Seem Unreasonable for us to join in ye charge of another Minister & House where we can’t be accommodated thereby. Thirdly, For that We Apprehend it would be Impracticable to Build One House that would with any tolerable Conveniency or Decency hold all the People at this Time, much less for ye future should our Numbers Increase as in Reason we may Expect. 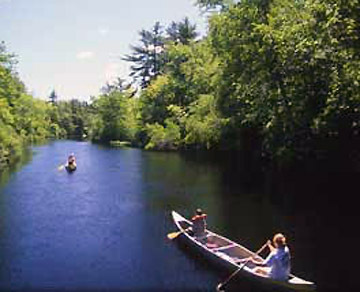 The meeting house was constructed, and dedicated in May, 1748. The leaders of the new church had been the most prominent men in the old, the wealthiest, the most influential, the highest in social distinction, and their absence in the First Church caused many years of distress. 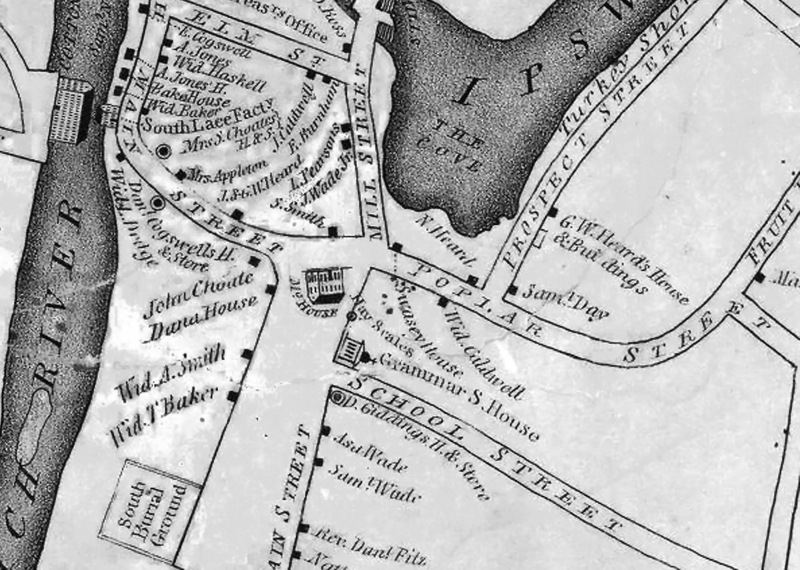 Closeup from the 1832 Ipswich map. The original sanctuary of the South Church is shown in the intersection at the top of the Green. 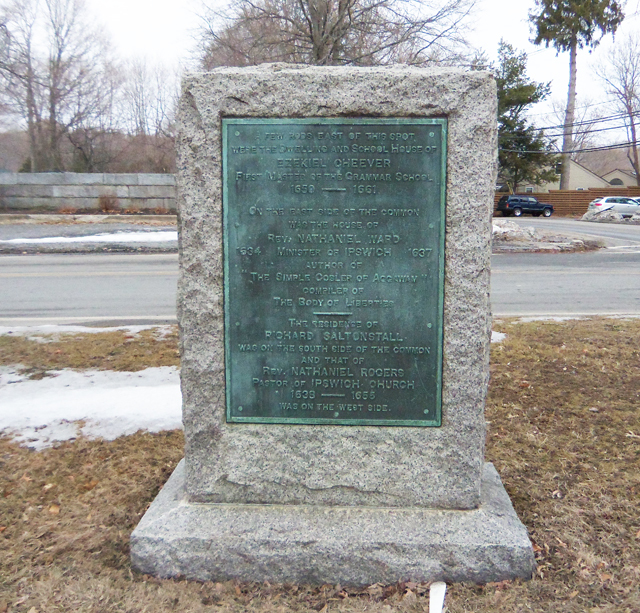 It was removed in 1837 and the new building was constructed behind it. The S. Smith house was moved to County Rd. where it still stands as the Rogers & Brown Bed and Breakfast. 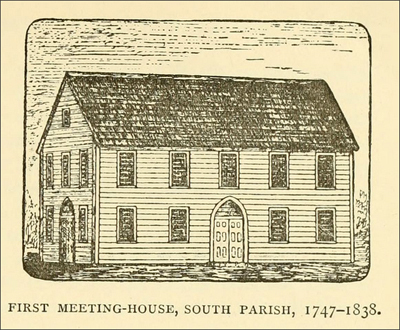 The original South Church meeting house was replaced by a fine sanctuary in 1838. 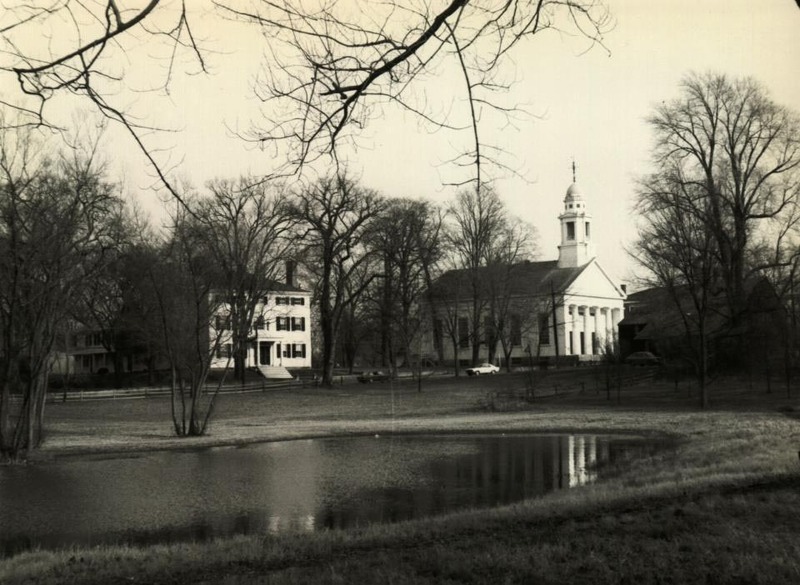 The house owned by Asa Brown was moved it to its current location on County Road in 1837 so that the South Congregational Church could be built facing the South Green on a lot west of the Heard mansion, now the Ipswich Museum. South Congregational church burned on December 10, 1977. 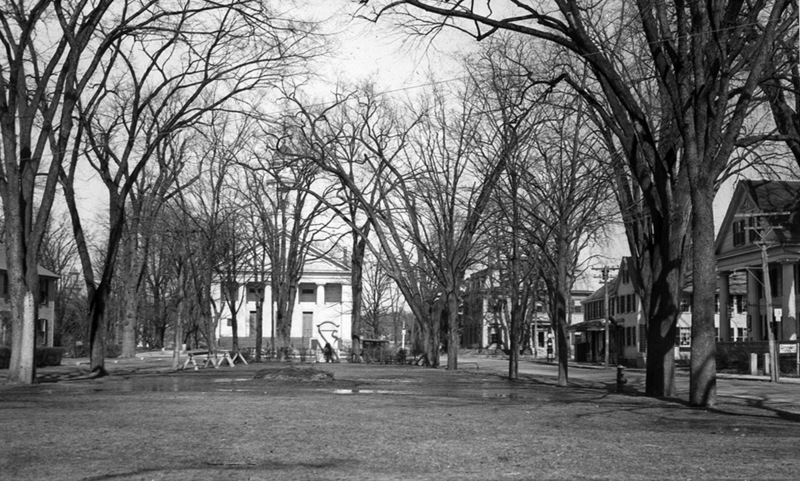 The lot is now a small park with two benches and the bell which survived the fire, surrounded by the old foundation. 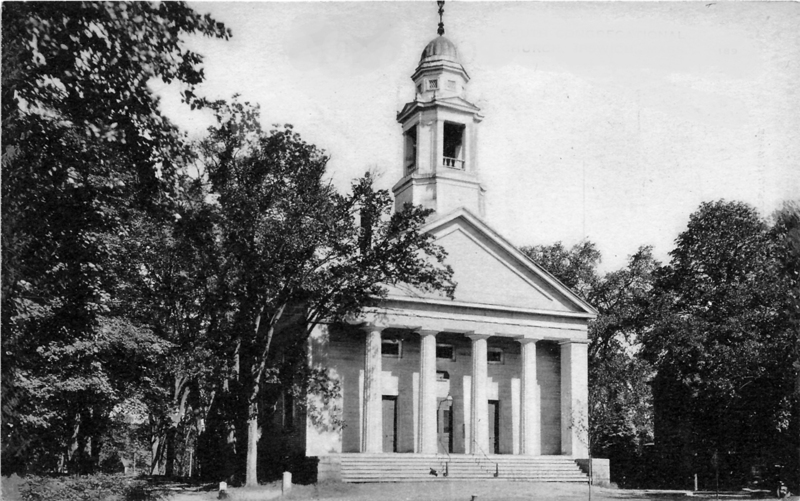 South Congregational Church, which burned in December 1977. 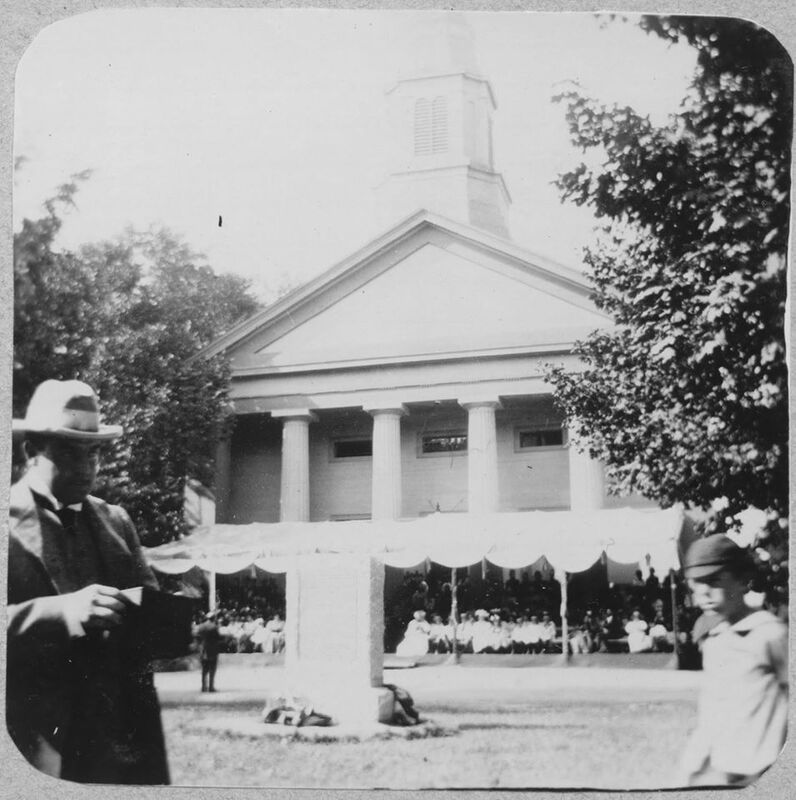 In June 1899, the church steeple was struck by lightning and burned to the bell deck, causing the destruction of the bell. 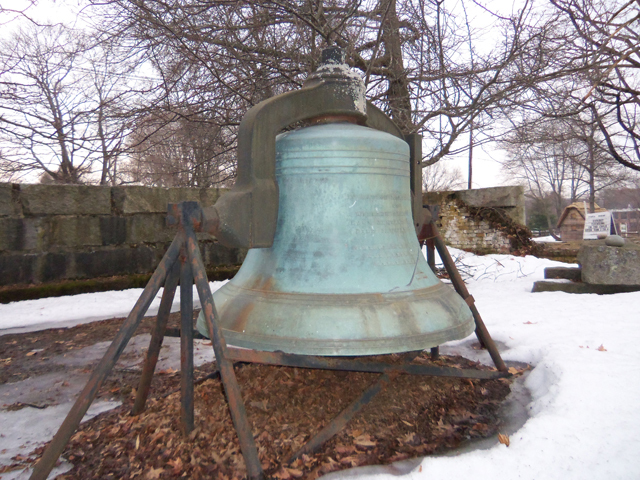 A new bell was contributed by Mrs. Elizabeth M Brown in memory of her husband the late William G Brown. 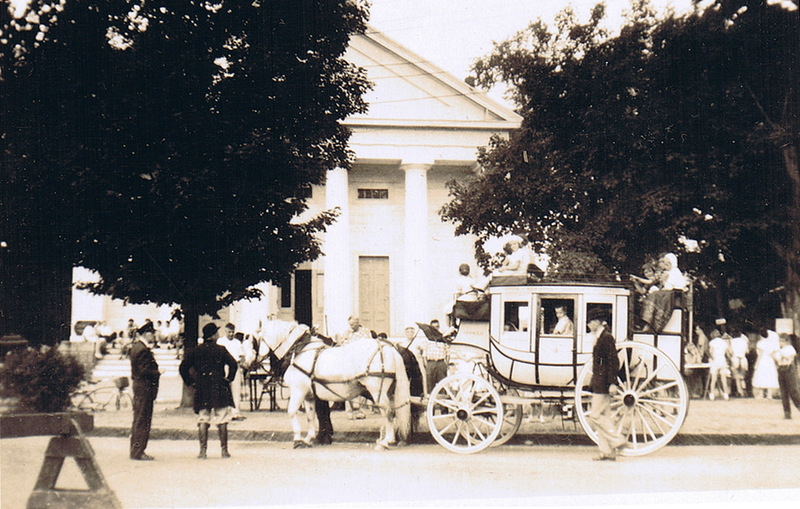 Although the south Church did unite with the North Church about 1920, it continued to be used for religious purposes. The Primary Department of the Sunday School continued to be held there, groups such as Christian Endeavor met there, and it was used for regular worship after the North Church burned until it too burned. Congregationalists felt a double loss.